Laura and Jim – Wedding Photography at The Old Barn, The Milky Way, Devon. It’s not everyday we get asked to photograph a wedding at a theme park, so as we made our way to Laura and Jim’s big day at The Milky Way in Devon, we weren’t quite sure what to expect. The day started out with a good mix of giggles and emotion during the preparations, followed by a really pretty and heartfelt ceremony under the vines in the beautifully light conservatory. As Jim is an Officer in The Royal Navy, it was only to be expected, then, that an archway of swords and light-sabres would be formed by his friends and fellow officers, and Darth Vader from Star Wars. Nothing out of the ordinary there. Frankly we couldn’t understand why Laura was so surprised. The guests were then led in to the wedding breakfast by the Stormtroopers, where laughter abounded during the very funny speeches and everybody dined in the soft glow of candles and fairy lights. 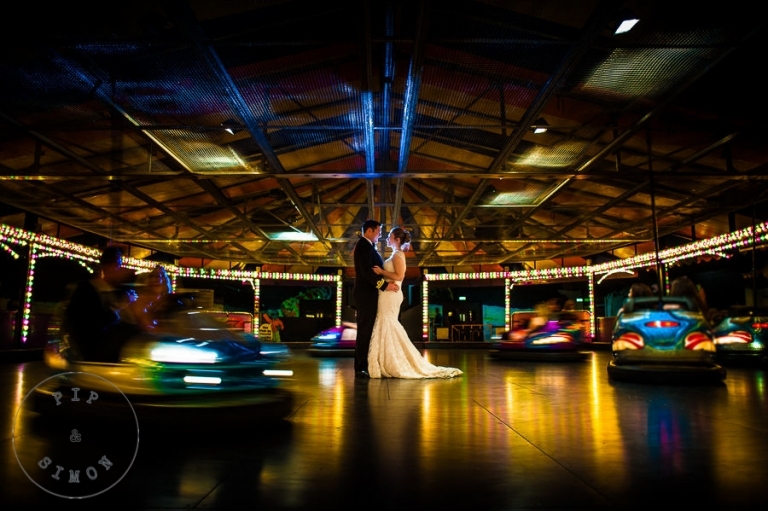 Not wanting to break with tradition, Laura and Jim then led their party to the usual, tranquil, post dinner ‘Bumper Car’ session, before hitting the dancefloor – hard. All-in-all, a totally normal day at the office.